1. Water = light: The water satisfies your need for a drink in a similar way to how the light satisfies your desire for a good exposure. 2. Faucet nozzle = aperture: The camera’s aperture is like the nozzle of the faucet where the water comes out. 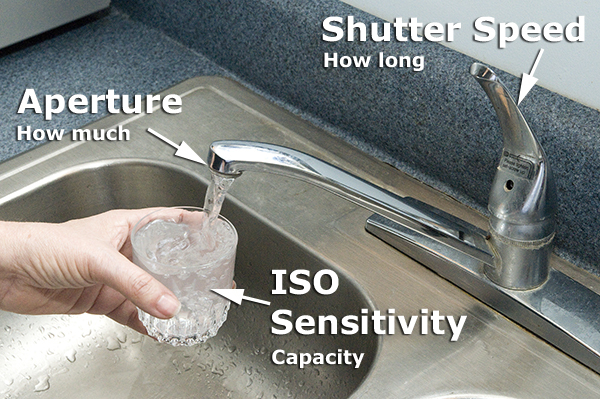 The size of the faucet’s opening controls how much water volume can flow into the glass in the same way the aperture opening controls how much light volume can get to the camera’s imaging sensor. A large aperture opening, such as f/2.8 lets in more light than a small aperture opening (f/11). 3. Faucet handle = shutter speed: The camera’s shutter speed is like the handle of the faucet. The handle controls how long the water runs into the glass in the same way the shutter speed controls how long the light hits the camera’s imaging sensor. A slow shutter speed (1/60th of a second) lets light come in for a longer time than a fast shutter speed (1/500th of a second). 4. Glass = camera’s imaging sensor: The glass is like your camera’s imaging sensor. It is a container for water, like your camera’s sensor is a container for light. To satisfy your thirst, the glass should be full of water, not half full, and not running over. In the same way, the camera’s imaging sensor should have a full exposure, not underexposure, and not overexposure. The capacity of the glass controls the amount of water it will hold. If you use a large glass, it will hold more water, while a smaller glass holds less water. The ISO sensitivity is like the capacity of the glass. A low ISO sensitivity (ISO 100) will only gather a little light, in the same way a small glass will only gather a little water. A high ISO sensitivity (ISO 400 and above) is like using a large glass to collect more water (light). This basic concept is how the camera’s exposure controls are related to one another. Similar to how the faucet controls manage water flow, the camera controls manage light flow. Although I’ve carefully studied light and its properties in school and have never had a problem understanding the concepts of aperture, shutter speed and ISO, a brilliant analogy based on the function of a kitchen sink is most helpful for every one of us to expand and solidify our understanding. THANKS! « All the Time Handle It Up!